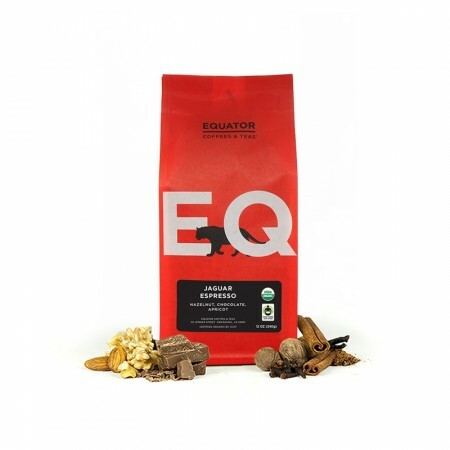 This is the Jaguar Espresso Fair Trade Organic brought to you by Equator Coffees & Teas. Jaguar is a complex espresso blend that combines Organic and Fair Trade certified coffees from the world’s major growing regions: Latin America, East Africa and Indonesia. With this blend they take a new world approach to a traditional-style espresso. Together these coffees provide rich, full flavors of bittersweet chocolate, spices, apricot and hazelnut. Not our absolute favorate bit still had a very good taste. This was more like a 4.5 (if you like a roast darker than medium). I would get this again. A dark roast from Dillanos set the bar for a 5 star. Equator just makes great coffee! Couldn’t tell the difference between the two but awesome coffee!! Greatly enjoyed the strong flavors. Finishing it off with a spot of steamed milk balanced it wonderfully. We have struggled with this one. My first shots were very sour. After using a finer grind (i.e. longer extraction), I got rid of most of the sour, but this has been our least favorite of the coffees so far. Nice, rich flavor. A bit more acid than I prefer. Works well in my espresso machine. Loved it, would definitely enjoy getting this in rotation again at some point. This was by far the best coffee I've had from MistoBox. More like this please! Really nice flavor, great cup of coffee or espresso. Enjoyed! Definitely in the top 3 of our list (along with Panther from the same company). Not as good as Good Folks Coffee. Extremely bitter. The initial taste is slightly richer like bittersweet chocolate, but that richer taste quickly gives way to a less desirable bitterness that is very close to lemon peel in flavor, and that lemon peel bitterness overwhelms the taste buds. This one goes in the trash bin. I definitely enjoyed this one. Tried this one as cold brew as well and it was pretty smooth. This one was lacking something. Lined it, didn't love it. Flavor wasn't deep enough. Had some nice notes, but something lacking compared to the previous beans (Calombe). Good - like it. Didn't make me cry though. I found the Jaguar Espresso to have a light bitter sweet taste, low acidity with good mouth feel. I can taste the hints of hazelnut and chocolate tones. Its not as dark an espresso as I like. This is a solid 4 stars with me, I would be proud to serve this to anyone. I utilized this exclusilvely in my DeLonghi espresso machine. Truly loved this blend. A prefect dark but delicate cup, rich and fragrant. The brewed coffee is not bitter which is good, however it is not flavorful...like it's watered-down and the flavor is "hiding" (don't know if this makes sense?). Loved this one! Thank you! One of my favorites currently. I really enjoyed this one. It was deep, warm, a full bodied. When I first brewed it, the hazelnut was up front, and as I've tinkered with temps the other flavors takes turns. This coffee was good. I'm not sure how to describe it. It almost had an herbal quality to it which was new to me. One of the better espresso's tasted so far in our journey to find that perfect espresso for lattes. It has a nice bold taste and definitely can taste the chocolate overtones. Love the stamping of a roasted on date. So important, but rarely found. I really enjoy the unique flavors of this espresso blend. Not typically what I would expect, which is awesome! The only real downside I can say is... relatively low caffeine content. This coffee it our favorite so far. It's nice and bold, but has a smooth finish. This expresso style coffee was not very strong and did elicit the deep rich taste I like with and expresso style coffee. The aftertaste was weak and is lost in the steamed milk for a latter. It is lighter on the acid so a milder coffee taste for me. Pretty good. Nice, robust flavor. I love this coffee it is bold and the favor lingers on my taste buds. It's so good I don't want to brush my teeth after drinking it. Enjoyed this coffee as a pour-over with milk. I found it to be an enjoyable dark roast! Hard to pin down whether this rating is correct or not, since as my first mistobox coffee, I don't have anything else to compare it to.Overall: I loved the smell of the whole beans, but I disliked the smell after grinding them.I made drip coffee.Even though I didn't care for the aroma of the ground coffee, I *did* enjoy the flavor. I'd say the aroma of the ground beans reminded me of a light roast, and the brewed coffee tasted great. Bland, uninteresting coffee. Roast is medium, flavor dull with mild chocolate notes and not much else. Not worthy of treatment as shot of espresso, but pairs ok with milk giving it some saving grace. These are the best beans I've had in my espresso machine, and its hard to beat my local roaster. Loved it. So easy to drink. Rich and dark, full-bodied. Slightly burnt notes prevent us from rating it 5 stars. East African coffee strains seemed to dominate this coffee. A bit too bright for my pallet. This coffee is not as dark as I would have preferred. Typically I drink Starbucks espresso roast. I enjoyed the flavor and this would make a great dessert espresso. I would prefer a bolder flavor with the rich under tones. I really like this one based on the 1st cup. It seems nice and strong. I might look for something creamier next time if that makes sense? I will enjoy this for sure this month.